During grocery shopping, do you sometimes end up at the checkout with a bigger bill than your wallet allows? It may be because you didn’t plan a shopping list ahead or you stepped foot in a supermarket with an empty stomach! Fortunately, there are a lot of strategies that can help you save money on groceries. Here are some tips that can help you be a smart shopper at the supermarket. The food piling up in your pantry may be more useful than you think. Give yourself the goal to use at least two items a week, plan your meals around them instead of buying new things. In other words, use what you got first before buying new things. Don’t step foot in a grocery store without first having done an inventory of your food stock. Don’t make meals from scratch, plan what you are going to eat every day and make a very detailed list of what you need in order to stay on track. Avoid the unexpected little shopping spree. Instead of going multiple times in the week, it is better to make one single trip to the store. This way, you can buy everything at once and limit the number of unneeded items you buy when you go. The less you shop, the more you save. Determine an amount of money that you will spend for grocery. 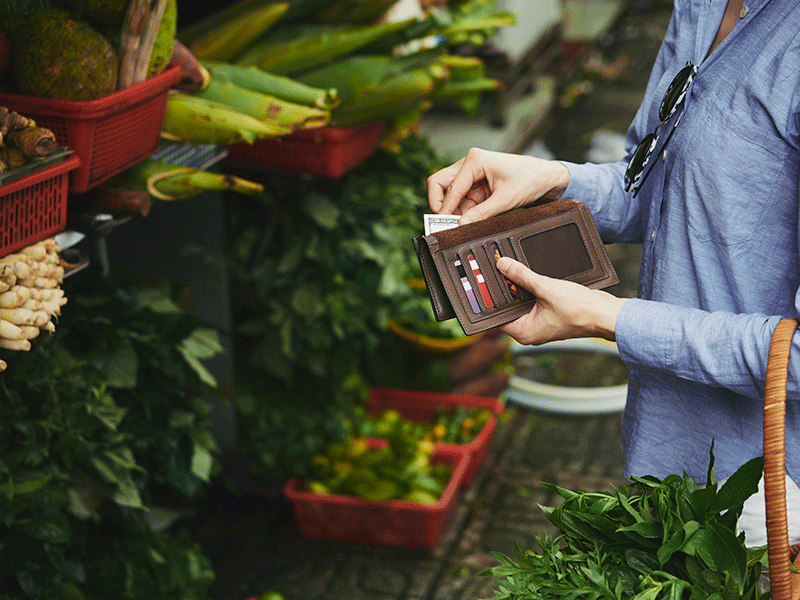 An easy way to stick to your budget is to shop with cash only. People who shop with a credit card pay twelve to eighteen percent more than those who shop with cash. As obvious as it seems, coupons are the best way to save money on your groceries. Forget about the cutting circular, now coupons can be found very easily online as various brands will offer them in order to make you try their new products. In the same way buying in bigger quantities work, when the item you eat every day is on super sale, buy more than one package so that when the sale is over you don’t have to buy more at the regular price. Eating seasonal products is better for you and your wallet! When you buy what’s in season, you buy food that’s at the peak of its supply and costs less to farmers and distribution companies to harvest and get to your grocery store. Shredded cheese, pre-cut fruits or any other type of precut food is definitely not worth the extra money. In fact, when buying these types of foods, you pay extra for the preparation of the said food. It may seem more expensive at first but buying in bulk is actually one of the best ways to save a lot of money. If you know, for example, that every day you eat the same granola bar, you can buy a bigger quantity because you know you will eat them all. Shopping with your loved ones can make your grocery bill much more expensive. Should we even mention kids? Some supermarket shelves are child-sized and the candy section next to the cashier are strategic locations that can add to your initial bill. If you don’t have a card with a reward program, you are missing out bonus. The points of purchases you get from it allow you to have discount and free grocery items. Women’s products such as razor blades and deodorant cost a few more than an identical product for men. Forget about the blue vs. pink limitations and buy that bleu razor blade that is as efficient as the pink one. This is the ultimate rule for those who don’t want to spend extra money on useless shopping. Eating before going grocery shopping will help you focus on what you meant to buy and not flange at the sight of what you want to eat right now. Next Next post: How to create a budget planner to jumpstart your savings?